The European Union and Georgia enjoy a very close and positive relationship. 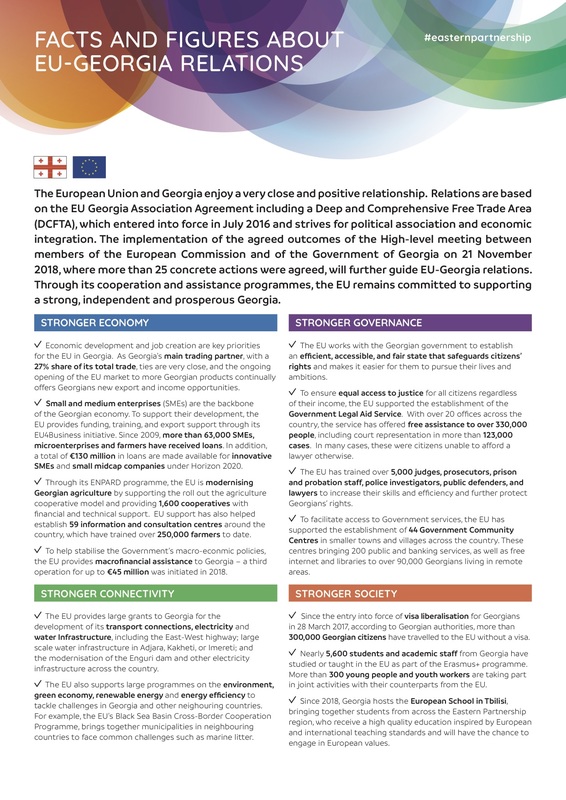 Relations are based on the EU Georgia Association Agreement including a Deep and Comprehensive Free Trade Area (DCFTA), which entered into force in July 2016 and strives for political association and economic integration. The implementation of the agreed outcomes of the High-level meeting between members of the European Commission and of the Government of Georgia on 21 November 2018, where more than 25 concrete actions were agreed, will further guide EU-Georgia relations. Through its cooperation and assistance programmes, the EU remains committed to supporting a strong, independent and prosperous Georgia.